This is a short art piece I out together after being told I have to leave this location for no reason after attacked by mobs of people over and over working with the police. This isn’t really about the art, but after I was told to leave, being the EXCUSE that it was because I had a camera and was taking pictures, I was being harassed before even buying it. And once I did, the private information was collected, and me attacked for the mere fact of just having it. I urge you not to give this gas station or Starbucks any of your money. They are criminals who cry wolf to get rid of people they don’t like. This is part of a 30 year terror campaign to get rid of me any way possible. approaching me. I pretty much assume it was not his real name, and some kind of confession digging tactic like normal. He basically told me, knowing that I was involved in Studio Photography, that if I ever take a picture of a person and I qoute “Exercise the law in my own way” which is what they have been doing to me for 30 years as you can see from my website and cnn posts. After this, the police officer told everyone in my community to park Toyota Camry’s up and down my street, teams of them, to create mental illness for disobeying his rogue orders. When calling internal Affairs in regards to this situation as well as everything. Not only did the IA officer play games about trying to hint about some internet troll (someone who tries to bait you or set you up to get rid of you) Screen Name “Breeze” who claimed her name was Julia Sofia Reynoso after me. Once I stopped communicating with this person a person someone Named Rodie morales befriended me with ulterior motives from my gym asking me to join him at Strip Clubs to find out after rodie was taking me to strip clubs he was telling everyone I was hunting this person down. Rodie was apparently working with the police in some other investigations as some news sources on the Internet stated. told me, someone would get back to me, as of course, nobuddy ever did. On 3 – 4 occasions from 20 – 30 this tactic was done to me while communities were told of lies in secret of these smears how I was doing all these things to people. And in each instanse, someone came into my life, followed me to the places I go or lived, then made up lies I was following them. This was not a one time claim, but over and over to make it look like I had a pattern of doing these things. This morning, when letting people know about these crimes being inflicted on me, a police officer was waiting in front of my place for me to leave. After I had left, of course so did he. Tonight when I went to get food, waiting outside for a to go order, a man came out with his kids using the normal tactics to try to bait me into a reaction. He started texting everything I was doing to this group online as people started sending me provoking messages on twitter and facebook to try to manipulate me into a fight as this is done over and over as my predators pretend they don’t know what’s going on and it’s some random event of some person with a problem. When the man saw that I was taking pictures, he approached me as I walked past him and away like people do to try to provoke a reaction to get rid of me. I told him cute kids as his 2 kids in pink were playing on the table. He came up to me saying. You took pictures of my kids. I told him, as a photographer, I have a right to take whatever I want as I was taking a picture of a car. He did not like me taking pictures for some reason using his kid as an excuse, and told me he would take my camera. When I did not back down, then man said, “I will call the police” I said, go ahead, the law protects people like me from taking pictures in public. The man then continued to call the police as if they have legal ground to tell me I don’t have the same rights as everyone else. On that note, a police car was parked about 50 feet away, as they were in the resturant. Most likely trying to scare me into submission by covert blackmailing tactics which is done over and over for 30 years. I decided to walk away to see if he would pursue me as he had ulterior motives to begin with, he did not, but he showed his true colors by the mere fact that he had something to hide and was trying to scare me out of my camera or to do what he and the police have been doing for the last 30 years. 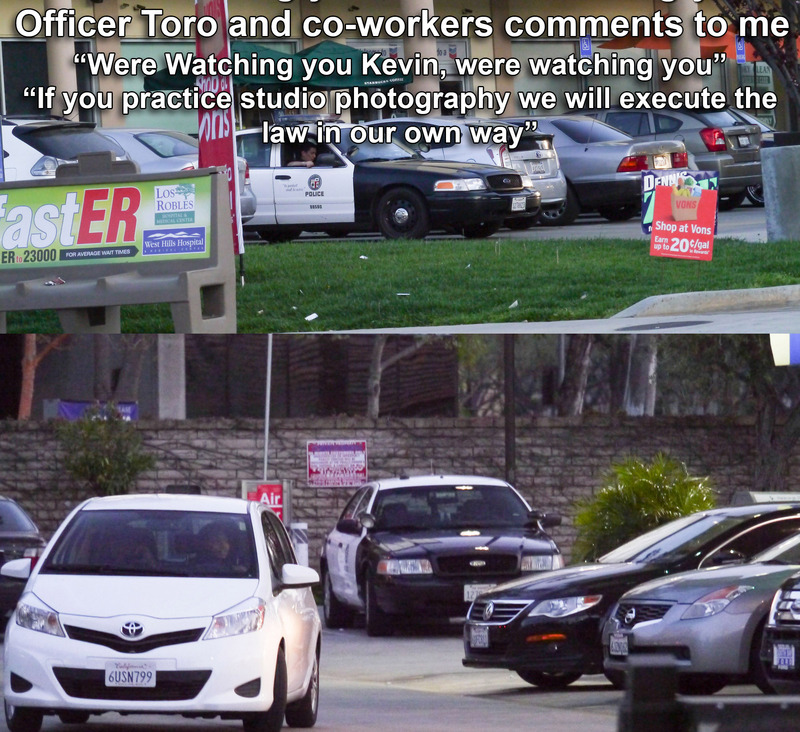 This is just a daily event of LAPD and Police coruption which need to be addressed above. As the police do not believe in following the laws. And to picking people at random and deciding to terorize them for unkown, or some kind of policing covert illegal red flagging type of thing. At one point, Police officers hinted I needed to stay quiet about the situation, as I kept trying to live my life, they still keep following me trying to make sure I am quiet, and do what I’m told. But the people, polititions and organizations against ccorrupt officers who think they are judges and try to sentence civiliation who not only have done nothing wrong, but even if that was the case, it would still be highly illegal. and then covering it up over and over, turning the situation around saying it’s my fault and I am up to something. Today, As I left my house, usually several people in the community are waiting for me to collect information and put it on the internet, and disseminate it to the city to then have people follow me trying to get confessions each time I am attacked. As I left my house, a car, who had taken off his plates, followed me as I was leaving. I looped around the park a couple of times to see if he was following me, and of course he was. So I stopped my car knowing this is a daily type thing since I found out 11 years ago. And he turned on his brights behind me and waited. I always carry a camera main reason I am a photographer, but since I noticed these types of things happening, I document everything because these people refuse to address what their problem is, and won’t leave me alone, harassing me 100’s of times per day offline, and 1000’s online. So I decided to record, this event, like I always do from day to day when I’m attacked. When I started videoing this person, he pretended to leave, then made a u-turn and came back around my car. I then proceeded to leave as he followed me again. He did this about 4-5 times. until finally, I went to my trunk and grabbed anything possible to defend myself. The only thing I had was a camera tripod but I figured that could put a stop to him. a couple of times, he left and then came back around. Finally I approached his car about to swing at him and he speed away. The thought of taking out his car with my tripod definatly went through my head, because if these people are going to do this all day and night, finding out 11 years ago, that they’ve been doing this for 30 yrs since my brothers crimes that he pinned on me to cover them up. I could at least cause him several thousand in damages to his car. But of course I refrained, which I sort of regret, as these people need to be held accountable for over 30 years of world wide damage to my life on every level, and daily mass mobbing with mental illness tactics to end my life, since I found out 11 years ago. The police know this is going, and most of this is under the duress. They refuse to put a stop to it, and even protect the criminal who have been targeting me for over 30 years. This happens at the Starbucks locations, coffeebean locations where I get food as well as almost every other locations and businesses I’ve ever been in. If I go somewhere that I can sit around and relax, teams of people are notified to come and harass me over and over until the end of time with passive aggressive, or covert tactics in subtle patterns. If I react in any way shape or formm or it’s even percieved that I react, it is then posted to the world on the internet, where I am then harassed all day and night with new lies and smears with people pretending they do not know me as they harass me. Today I went to the Starbucks, Encino california where they told me I could not go in, because they won’t leave me alone and I told the manager that I was being harassed all day. Then manager then told me I could not come inside because I addressed the issue. When I went to the location and sat outside, amongst other things goinf on such as people walking by sending me hidden messages over and over, I have documented the more obvious. Today, teams of people came in wearing solid black pants, and solid green shits. As these images represent only 3, I have more on servailance, just don’t have the time or energy to go through them all. But also, teams of people came in wearing all black. Black shirt and pants. I have documented about 14 people at Starbucks coming in wearing All black to try to make me sick, and a few hours. When I left Starbucks and went to Woodland hills,ca where I live, as I started walking in the park by my house, neighbors started to come out, like they do every night with the intent to create mental illness. about 18 people came out wearing all black in a 30 minute to 1 hrs time with the intent to make me mentally ill. This is just 1 incident today of the same thing that’s been going on for over 30 yrs. each location, mimicing back everything I say. These are a few examples out of 1000’s of tactics people are told to do. This has happned at alomst every place I’ve been around the world. time until I can no longer function. I have to document this because these mas mobs refuse to stop doing what they are doing for the last 30 years.